Usually a designer will make a number of models starting with quick card models progressing to more detailed scaled models manufactured from more expensive materials. Sometimes specialised modelling materials are used to produce hyper realistic models. 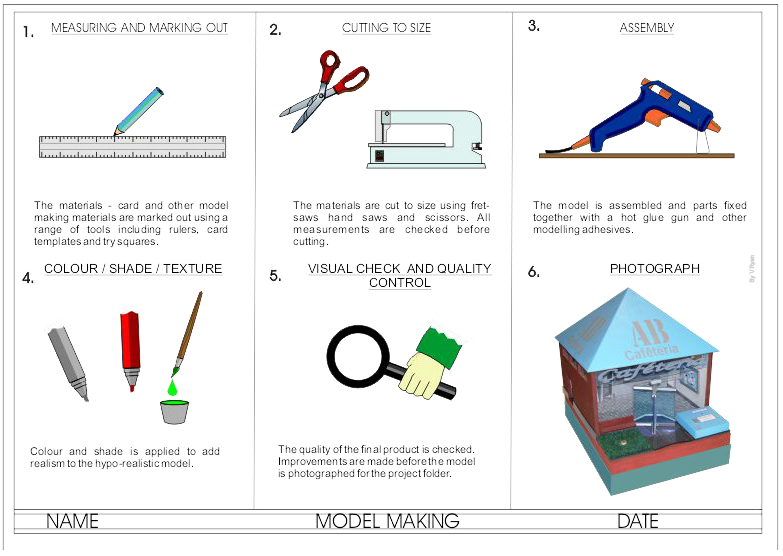 Making a model or range of models is regarded as good industrial practice. 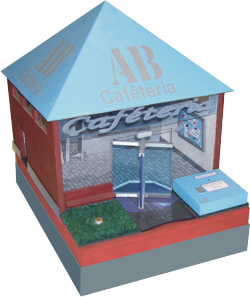 The model cafeteria below has been manufactured from a range of model making materials. It has been fitted with four temperature sensors. They have installed to detect fire as the temperature will rise quickly when a fire takes hold. This is a working model and can be tested / evaluated. Improvements can then be implemented for the final design and product. The computer generated model of a simple folding chair has been produced using CAD (Computer Aided Design software). It allows the designer to rotate the model and to zoom in on any aspect of the design. Produce a sequence drawing that clearly shows the manufacturing of the realistic model. 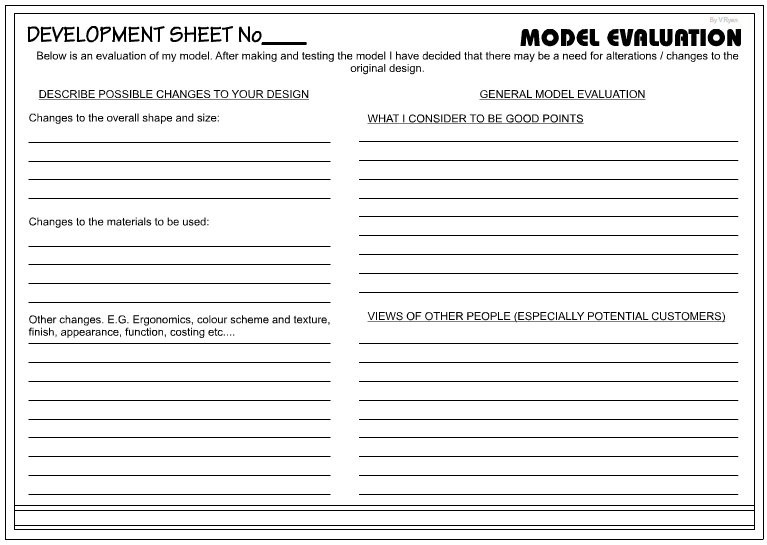 Evaluate the model. The model could be shown to potential customers and suggestions for improvements recorded. A sample evaluation sheet is shown below. 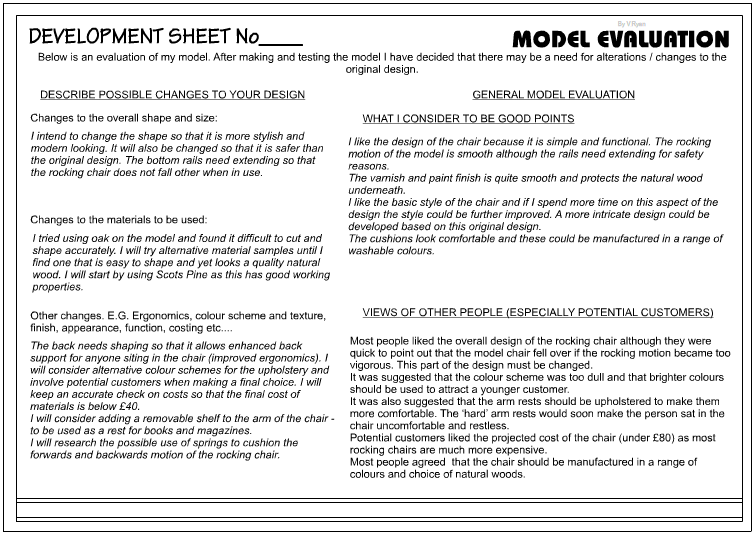 The sample model evaluation seen below has been written for a model of rocking chair.